The development of the 2014 Mercedes-Benz S Class has been an open secret thanks to the work of spies and even Mercedes' own revelations. Now we get our first completely undisguised look at what is most likely the next S Class courtesy of a leaked image making its way around the web. While sharing the same core styling as the car seen in our spy shots, the new image has more dramatic styling at the front end, indicating it's likely equipped with an AMG package, or is itself an AMG-tuned S Class. LED daytime running lights and turn indicators, a larger, reshaped grille, the sculpted, angular front end aerodynamics, and large alloy wheels are the dominant features in the leaked image. Inside, the 2014 S Class has already shown itself to be another masterwork in the luxury sedan class, with a new twin-spoke steering wheel, quilted leather upholstery, and individual seating for four (at least in one configuration). A coupe and a long-wheelbase version are also expected to join the S Class range for the 2015 model year. The regular sedan version of the 2014 S Class is expected to make its debut early this summer. Stay up to date on all of the latest developments with the 2014 Mercedes-Benz S Class here. I thought the US only gets the long wheelbase version. Is the article suggesting the US will get a regular wheelbase and then a long wheelbase in 2015? I doubt the U.S will only get the long wheel base version, In canada we get both right now and from what I see the majority are "regular" wheelbase. If US does get both versions then this would be a shift from the current status - W221 - only available in a long wheel base form in US. Most countries have both including Canada. Only countries listed as having only long wheelbase: USA, Russia, China, Mexico, Indonesia. Rumor is there will be 4 body styles. Regular, LWB, XL and Pullman. I do not believe the US will see regular as they didn't for current iteration. The new Mercedes S-class due this fall turns the page on more than a century of incandescent lamps in cars. Totally rid of hot filaments, the sixth-generation S-class sedan will instead be fitted with 490 LEDs filling all lighting, signaling, and interior-illumination roles. The auto industry is shifting to light-emitting diodes because their expected life is three times that of the average car. They also improve mileage by consuming a fraction of the energy required by conventional headlamps. At the rear, their quicker response adds 15 feet at 75 mph to the warning distance provided to cars behind. Unlike high-intensity discharge (HID, or xenon) lamps, LEDs contain no mercury, so they’re also environmentally benign. Essentially specks of doped silicon on a circuit board, LEDs are frugal because they convert electricity to light with minimal waste heat. Since LED-based headlamps can be half the size of conventional lamps, designers now use this technology to redefine the faces of their cars, with added functions bound only by their imaginations. For example, the European S-class keeps its high-beams lit most of the time, using motorized masks to block the part of the beam that would dazzle oncoming traffic or cars to the side. The computer-controlled masks also eliminate glare from reflective signs. To avoid blinding drivers at the rear in heavy traffic, the S-class’s brake- and taillamps are lit at varying intensities. The current S-Class is looking a bit dated after getting used to seeing pictures of this design, can't wait to see it in person!! 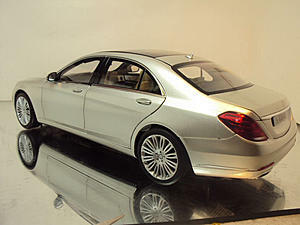 The W222 Mercedes-Benz S-Class, which is completely new for the 2014 model year, is shaping up to be a very interesting car. As dozens of examples patiently wait outside the factory, we learn a bit more about it, with only eight days left to go until its official unveiling, which has been programmed for May 15. Given that the current generation, first introduced in 2005, is still on par with many of its rivals, we expect the W222 to really impress us, once full details are revealed. For instance, the Mercedes flagship's interior gets what’s called a “Warmth Comfort” package, which, coupled with the sophisticated climate control system with active perfuming and filtering of the air, will make the lowest of temperatures irrelevant. Engines-wise, German news daily Bild reported that most of the units will be carried over from the outgoing car, while the S250 CDI variant, the only four-pot version you can buy, will be dropped due to low demand. The newspaper said that the two engines it will be available with at first, will be the familiar S350 CDI 3.0-liter diesel with 258 PS / 255hp, and the 5.5-liter V8, with 435 PS / 429 hp. Expect to see the same S63 and S65 AMG versions as before, with power outputs of 571 PS / 563 hp and 630 PS / 621 hp respectively. Lastly, it is reported to be priced from just under €80,000 in Germany, which equates to $105,000 and £67,400 at current exchange rates. The soon to be replaced W221 starts from just under €72,000 in its home land, so the new model will be a tad more expensive. To each his own of course, but that dashboard and steering wheel don't look too appealing to me. Sure, the car has great technology I am sure. But with the dash and wheel, plus what appears to be bland exterior styling, I think closeout W221 sales are going to be very strong. WHAT IT IS: The four- or five-seat convertible S-class is the spiritual heir to Boss Hogg's white Cadillac (without the longhorns). Like the Ocean Drive convertible concept that appeared at the Detroit show in 2007, the S-class convertible will use a large retractable softtop. Unlike the concept, it will have only two doors. The production car won't look like the slab-sided concept, either, instead following the CLS, CLA, and various other Mercedes models down the path of complex surfacing. WHY IT MATTERS: This car is part of a three-model strategy to push the S-class upmarket and claim some of the ground the euthanized Maybach was supposed to cover. After all, what says money like a gracious, powerful, ultra-luxury convertible? PLATFORM: As its name indicates, the convertible rides on the next S-class-sedan platform, which also will underpin the S-class coupe (formerly known as the CL-class). It is constructed primarily of steel, with aluminum used for the doors, hood, and trunklid to save weight. As with the current S-class, the convertible will employ an air suspension. POWERTRAIN: Both V-8 and V-12 engines figure in the next S-class plan, and there's every reason to expect this high-end softtop version to follow suit. COMPETITION: Bentley's Continental GTC and the Maserati GranCabrio. WHAT MIGHT GO WRONG: An exploding sun could render top-down driving unpleasant. Otherwise, we can't think of anything. ESTIMATED ARRIVAL AND PRICE: The S-class sedan arrives in fall 2013, the coupe in the fall of 2014, and the convertible a year after that. Figure on spending about $150,000 for the droptop. dude!!! get your foot off the seat! Looks like it's definitely trying to close the gap after Maybach was decommissioned.